Pammy Blogs Beauty: Best Year Ever! 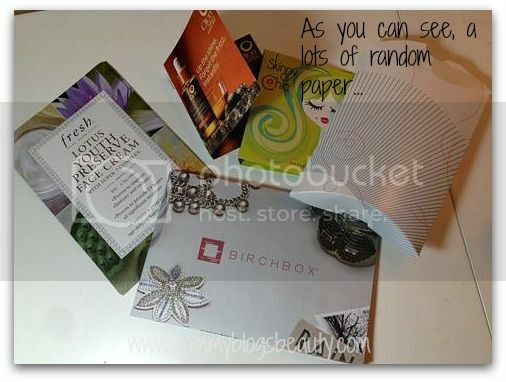 January 2013 Birchbox: Box Opening! Best Year Ever! 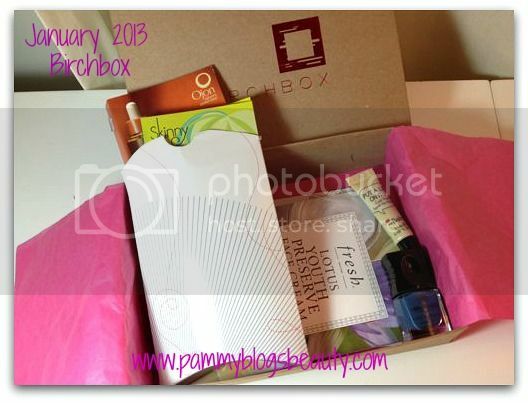 January 2013 Birchbox: Box Opening! Can you believe that 2013 starts my 3rd year as a Birchbox subscriber! Wow! Time flies!!! Birchbox wants 2013 to be your "Best Year Ever"! No, this doesn't mean you need to go changing yourself with unattainable resolutions. Just use this new calendar year to focus and accomplish those little things that always fall to the bottom of your to-do list! So, Birchbox wants you to make a simple goal: Just make 2013 your "Best Year Ever"!!! To help with this, Birchbox included a fold-out poster in this Birchbox with 25 simple tips and ideas to boost your happiness! Have more ideas? Then tweet them to Birchbox with the hashtag #mybestyear. I have been a Birchbox subscriber for 2 years (OMG! Crazy!!!). I have reviewed each and every Birchbox that I have gotten! So, if you are curious to know the exact deets about what is inside. 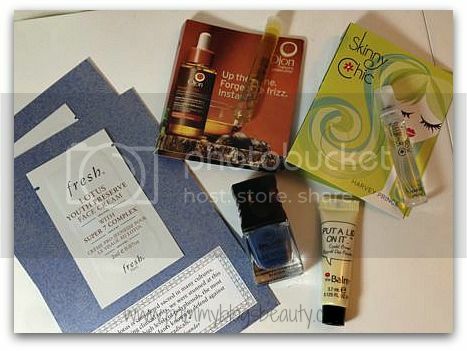 Please feel free to go through and read my previous Birchbox "Box Opening" post! Here they all are! Whew! Birchbox Introduction Post, Jan 2011 Birchbox, Feb 2011 Birchbox, March 2011 Birchbox, April 2011 Birchbox, May 2011 Birchbox, June 2011 Birchbox, July 2011 Birchbox, August 2011 Birchbox, Sept 2011 Birchbox, Oct 2011 Birchbox, Nov 2011 Birchbox, December 2011 Birchbox, January 2012 Birchbox, February 2012 Birchbox, and the March 2012 Teen Vogue Birchbox, April 2012 Birchbox Box Opening, May 2012 Gossip Girl Birchbox Box opening, June 2012 Birchbox, July 2012 Birchbox, August 2012 Back to School Birchbox, September 2012 Birchbox, October 2012 "Goop" Birchbox, November 2012 Birchbox, and December 2012 Birchbox. 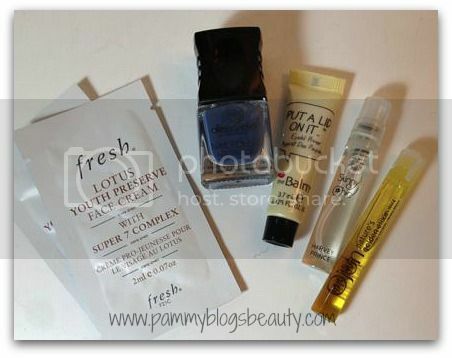 What is inside the January 2013 Birchbox? The January 2013 Birchbox: "Best Year Ever"
alessandro | Nail Polish in "Blue Lagoon" (sample size: .17 fl oz, full size cost: $12): I am always very happy to see a nail polish in my Birchbox! I have never heard of this brand. Have you? This shade is a soft medium dusty blue opaque shade with a satin/cream finish. Apparently this polish is a Birchbox exclusive! What a pretty shade. I adore wearing blues on my tips! I am totally going to paint my nails with this polish today. Yay! Ojon | "damage reverse" Instant Restorative Hair Serum (sample size: small glass vial, full size cost: $25): This hair oil has such a yummy scent! My dry hair loves hair oils. So, I am excited to try this. Actually, I will be reviewing a larger size sample soon for Birchbox. So, be sure to come back and check out that post. I am really not a fan of the little glass vial packaging of this sample. I am so prone to spilling these! Lets hope I don't. While I wish this sample was larger, this size is perfect for a weekend trip. theBalm cosmetics | "Put a Lid on It" Eyelid Primer (sample size: .125 fl oz, full sized cost: $18): I flippin love theBalm!!! Actually, it is a brand that I was introduced to through Birchbox. So, yay for that! If you have never tried their cosmetics, their products are...well...theBalm! ;) Yes, from their catchy play-on-words names, their kitchy packaging, and their phenomenal products....I have nothing but love for this brand! So, I am very excited to try out this eye primer. This is a deluxe sized sample. While it is small, it is an eye primer and even the full sized tube of this is not that big. Can't wait to see how this works! BEAUTY EXTRA: Fresh | Lotus Youth Preserve Face Cream (two foil packets, full sized cost $42): I really like the Fresh brand! The cream contains antioxidant rich lotus flower extracts. Paper, paper, paper: This Birchbox seems to have a lot of extraneous paper! There is the fold out New Years Tips poster, the usual tissue paper, all of the cards that the sample vials and sample packets are attached to, and a little re-suable box thingy (instead of the inner tissue that they used to wrap and tie with a ribbon: I personally like this better...I am more likely to reuse tissue paper than this little logo printed folding box). It just seems like a lot of unnecessary paper. But, that is just me! My fellow Birchboxers, what did you get this month? What samples are you excited to try? I included my referral links in this post. The only thing the same in mine is the Balm primer which I'm happy to have. I was on the verge of cancelling but my box is pretty decent.